The Internet is a series of local networks and computers tied together world-wide (called wide area networking) for the purposes of commerce, recreation, education, and interaction with others. When you purchase internet access service from us, you are joining our network of users so that we may connect you to the broader internet. No one owns or controls the entire internet, it is largely a wide open, uncontrolled environment. Users of our internet service are responsible to take precautions to protect themselves, their information, and their property from any content they dislike or from persons with malicious intent. Users also must take care to use our service in an “acceptable manner”. For more information, please see our “terms and conditions of internet service” policy. Broadband is a generic term that is often used to describe a high speed networked connection to the internet. There are two basic components to our broadband service; the internet connection, and transport back to the customer service location. There are a variety of technologies and protocols in use within our network. We primarily, but not exclusively, use a technology known as ADSL (sometimes called DSL for short) to deliver data to the customer location. All internet connection services, including ours, operate by sharing bandwidth among users. Not all users are placing high demands on the network at the same time so bandwidth is effectively shared among users. Occasionally users may place higher than normal demands on the network causing congestion. Bandwidth (also referred to as internet speed or transfer rate) is a method of identifying how much data may flow across an internet connection over a specific time interval. A higher bandwidth connection will allow more data to flow across the service much the same way that a road with more lanes will carry more traffic. Higher bandwidth connections are beneficial to customers that have more internet users and more devices in their home. All of our internet service plans should be suitable for real-time streaming applications. Users should realize that not all applications operate in the same manner and some will work better than others. See our “common broadband issues” page for more information. Our internet service plans are designed for general purpose residential type internet use. Public IP addresses are not available on these plans. Be aware this may limit your use of certain equipment on our network. We do not provide any e-mail services, gaming servers, web hosting, internet content, virus scanning, firewall or content blocking on these plans. See our “terms and conditions of internet service” policy for more information. Since internet access involves shared bandwidth over connections that extend outside our network with unpredictable user demand, we cannot guarantee any data transfer rate for any plan, all internet access services are offered on a “best effort” basis. This means the data transfer rates you experience on any plan will fluctuate below the maximum advertised rate. We offer a variety of internet access plans for our customers. Not all plans are offered in all areas, an internet access service plan will only be offered to customers in a specific area at our discretion. * These Plans are only offered to customers that also have voice telephone service in the same customer name at the same location as the internet service. Non-recurring installation charges will apply. A deposit may be required on your account to establish internet access service. See our "terms and conditions of internet service" policy for more information. We do not place data limits or download premiums on these plans. Other packages may be available in your area, for more information, please call our customer service experts. We do not Block user access to lawful content. We do not throttle (slow down) user access to lawful content. We do not favor some traffic over other types of traffic (affiliated prioritization). We do not offer paid prioritization in our network. During times of congestion our network typically handles traffic on a first come first served basis and we do not “manage” traffic based on criteria we assign. We do take steps to block access to our network configuration and equipment by our users and others outside our network on the broader internet. We do not block user access to the internet with these practices. Users are prohibited from attaching some devices and certain uses of our services and network, particularly if these are used to harm us, our network performance, or our equipment. We do not provide any security to our users. Users are required to provide all security devices necessary to protect themselves, our company, our network, and other users on our network. See our “terms and conditions of internet service” for more information or your may call our customer service experts. The availability of DSL service is governed by many technical and engineering constraints. If you would like to order DSL, please call our customer service department. They will gather the information necessary to prepare an application for DSL service at your location. 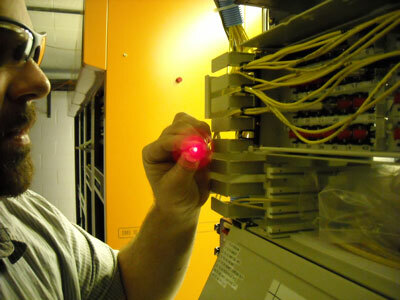 Our technicians will then test your telephone line for DSL compatibility. Our Customer Service Department will call back to inform you of the results of our tests. If successful, we will take an order for DSL service and explain the charges for service. If the test at your service location is not successful, don't panic. DSL technology is advancing rapidly. We are continually reviewing new technologies that allow us to extend our DSL footprint. Please check back with us at a later date to see if availability has change in your service location. Please read the terms and conditions of service for your broadband plan. They contain important information about our service and your responsibilities as an internet access customer. Do you have dial-up internet plans available? No, we do not offer a dial-up internet access plan, only broadband plans. What equipment do I need in order to use my internet service? You will need at least a computer with an ethernet adapter. You may also use a variety of tablets, laptops, smart phones or other devices with an ethernet adapter or WIFI capabilities that are designed to connect to the internet. We provide you with a DSL router that is programmed to correctly interface our equipment as a part of the service we provide. How new must my equipment be? Even older computer equipment may be able to access the internet but you should be aware that old or out dated equipment may not work well to display content including displaying web pages or watching video. We recommend using newer equipment and keeping it updated according to manufacturer and software company direction. If you are not sure if your equipment can support internet service please consult an authorized computer technician or the manufacturer. Can I just buy a computer from you? No, we do not sell, service, maintain, or support computers, network equipment, or peripheral equipment to the public. How many devices can I connect to the internet? Do I need separate Internet services for each device? A single internet connection can support multiple devices connecting to the internet at the same time in the same household. However, attaching too many devices may degrade your internet experience. Can I share a broadband service with my neighbor? No, we do not allow customers at separate households to share an internet connection. Our internet service must work at only one household. Customers attempting to share or re-sell an internet service to other households will have their internet service terminated at a minimum. Visitors may connect to and use your internet service with your permission while they are at your household. How can I stop someone from accessing my internet service? Do not give them your wireless passwords or allow them to plug equipment into our DSL router at your house. If you give out your connection information then you may not be able to stop them from connecting. I have special WIFI equipment that I want to use. Can I connect my own WIFI equipment to my internet service? Yes, you may. You may connect your WIFI equipment to an ethernet LAN port on our DSL router. Configure your WIFI equipment to work as an access point only so that your equipment does not interfere with our DSL modem. If you do not know how to configure your equipment as an access point only, consult the manual that came with your equipment or contact the manufacturer for instructions. Why does the DSL modem you gave me look/smell funny? Our DSL modem equipment is heat sensitive. You should not stack paper or other items on top of that equipment as it could cause damage to the equipment. You should also locate the DSL modem in a central part of your house or closer to the places you use it most in a slightly elevated position. The WIFI capabilities will work best with the shortest path to WIFI users and if the unit is at or slightly above the devices that it connects to. Why can’t I get WIFI signal in my yard/barn? WIFI equipment today is only designed to travel between a few feet and a couple hundred feet at most. As that WIFI signal passes through walls, furniture, and other items in your home the signal is naturally degraded, this shortens the distance that your WIFI will work. This is a normal trait of WIFI and is not a defect in the equipment. Working for only a short distance helps keep WIFI equipment from interfering with other WIFI equipment used in the area. What does best effort mean? Best Effort means that the actual performance of the service will vary depending on the circumstances surrounding what you and others using the service at the same time are doing. Congestion can and does happen both inside and outside our network. How do I contact you if I have other issue or questions? Please see the contact page on this website.